The political and social climate of Lyon in the second century was bleak for Christians and those whose faith did not align with the values of Rome and the emperor Marcus Aurelius. The good that Christians had done through prayer, generous giving, and hospitality was quickly forgotten when the people cried out for a scapegoat as they inevitably and often did. Blandina was a Christian slave to a Christian master and this presented an interesting dynamic into her experience at the hand of Rome when she and her brothers and sisters in Christ were arrested and threatened with death if they would not give up their convictions for the commandments of Rome. Citizens of Rome at the time faced death by the comparatively easier method of decapitation. Slaves died slowly at the hands of the imperial torturers and their cruel tools. This was dramatically effective for Rome because many slaves would often choose to renounce their faith and implicate their masters when threatened with torturous death on one hand and offered freedom from slavery on the other. They had more to gain in apostasy and so they were considered prime targets for imperial coercion. Because of this tendency for slaves to renounce the faith for promises of freedom, Rome was able to convince slaves to lie about their Christian masters and insist that Christians were cannibals and incestuous. These lies only furthered Rome's efforts at propaganda and made it easier to deceive a population all too eager to be part of the accepted majority and all too afraid of being outcast from society. All of this only made the lives of the Christians more challenging. The brothers and sisters of Blandina feared that she would renounce the faith because of the torture that loomed over her and her relatively small size. They assumed that a woman of her stature and livelihood would suffer greatly under the hands of the empire's best ministers of agony. Nobody would have been surprised to see her cave into the empire's demands but they all hoped that she would be able to withstand the torture. So, they did what Christians do--they prayed for her and encouraged her to face her inevitable suffering with faith, hope, and love. Blandina was indeed tortured and it was gruesome at best. With each new savage effort to destroy her faith she repeated one phrase to those charged with producing agony within her: "I am a Christian, and we commit no wrongdoing." Eventually, she outlasted her torturers and they returned to their leader and insisted that they had nothing else to offer in the way of pain. On the day of the execution of Blandina and her brothers and sisters in the faith there was one more planned torture for her. But this time it was psychological. They brought her in chains to the arena to watch her brothers and sisters be beaten and executed. They expected that being confronted with the brutality and finality of death that she would renounce her earlier confident confessions. Yet, she surprised them by loudly calling out to those being martyred and encouraging them to face their deaths with faith, hope, and love. She encouraged them to forgive those who clearly were deceived by the darkness of Rome and their own inescapable sin. When the guards realized she was only encouraging her brothers and sisters they drug her away and prepared her for own vicious death. They tied her to a stake in the arena so that she might torn apart by vicious animals to entertain the Roman crowd. 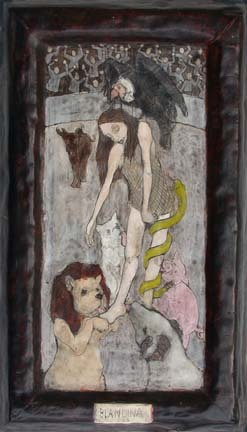 The animals, however, refused even to approach her as she prayed quietly for her accusers and captors. Finally, they cut her loose from the stake, wrapped her up in a net, tied her to a hot, iron grate, and cast her again before a bull. As she prayed, Blandina was gored by the bull and thrown into the air. After some time, she finally died and received her martyr's crown. Wow, this was extremely helpful! I wanted to research some basic info about Blandina for a school paper, and your essay was about the only unique one. All the others were quite litterally copied and pasted from each other. Thanks a bunch!